Dragonborn sorcerer (and con man) Argar Da'argagaar and his thick friend Aramus Perterberator, a blaqueguard fighter, burst from the Stygian darkness of the Underdark like spring hares running from the hounds of hell, having very recently done their very favorite thing: cheating a rich and powerful tyrant out of his riches. Only this time, like many other times, something went slightly wrong with the plan. The ancestral relic warhammer they were hired to retrieve for a Dwarven king was discovered to be a fake. And once again, the chase was on. Emerging from the Underdark into the almost crueler light of their beloved home of Faerun, the two career five-and-dimers quickly slipped into one of their tried-and-true escape routines, disguising themselves as a Phlan city guard and his draconian prisoner. Little could they even envision in their wildest schemes that it would not even be possible to hide from the frenzied knot of labyrinthine events that would sweep them up like helpless capybara in the iron talons of a Manticore. Pursued by enraged dwarves, Aarg and Peterberator concluded it would be best to put as much distance between them and their latest boondoggle as possible, and a shadowy, slinking figure at the edge of the forest offered them the opportunity to do just that. "My name is Girtith" said the Deep Gnome, who was blind. It seemed he had appeared from nowhere, but after a volley of small talk it was established that he, too, was in a mood to be anywhere but here, and knew of a way to escape. After a few hours of trudging through the dense and brackish Gnotwood Forest, the choking brambles gave way to a clearing where the new band of allies saw a whimsical, yet welcome sight: a tall, gray tower festooned with what looked like a wizards hat on top. Oddly enough (perhaps not so oddly in retrospect) the Deep Gnome knew of a secret entrance, and guided Aargar and Peterberator to a friend he knew who may just be able to help them with their being chased by angry dwarves dilemma. So it was decided they would meet the mad genius who inhabited the top floor of the tower. It was decidedly not decided that when they met the Cloud Giant who inhabited the tower that the entire structure would start to rumble and launch itself into space moments later. So much for proper introductions. It also was not expected, gauging from the Storm Giant's shocked reaction, that the tower would be boarded by Phyrexian space pirates only moments into the "Hello, who the hell are you and why are you on my spaceship tower thingy?" conversation that was just starting to get good. The Cloud Giant was more than capable of fending off the pirates, but what he couldn't have accounted for was the unquieting effect the combination of Argar Da'argagaar and Perterberator can have on otherwise merely out of control circumstances. It's possible the goodly, but slightly whacky giant may have had a sphere of annihilation in his possession, and it's also possible that sphere of annihilation may have been mesmerizing to one Argar Da'argagaar, and although details are sketchy, a Mage Hand may have appeared from "somewhere" and made an attempt to grab the sphere, thereby creating a chain of events that culminated with the Cloud Giant being swallowed by his own Sphere of Annihilation and the walls of the tower exploding, and Argar Da'argagaar and Perterberator being ejected into the Astral Plane. Allegedly. It was while floating aimlessly through the Astral Plane that Argar Da'argagaar and Aramus Pertberator met the band of fellow reprobate loonies that would simultaneously become their thickest friends and oft times their greatest enemies. Managing to grab hold of a cylandrical platform in the midst of the ether, Argar Da'argagaar and Perterberator were immediately attacked by a Ranger named Dench and a winged Kobold named Podo. Perterberator managed to secure Argar Da'argagaar's release in exchange for breaking the choke hold he had on the winged Kobold. And that is how Argar Da'argagaar and Perterberator met the party of characters with whom they would subsequently destroy the very fabric of the Multiverse, then reshape it into something even better. After some ruffled feathers and puffing of chests, moderating voices like the Mystic Borana and the Bard Rowan managed to keep Argar Da'argagaar and Perterberator from killing their new friends who had attacked them first with no provocation, but there wasn't much time for peeing for distance because even in the Astral Plane you're never really alone, as an airship drew closer the party saw the ever-serious face of Gith herself, would-be liberator of her people from the Mind Flayers, twisted into a mask of determination. Being trapped on the Astral Plane with no way to return to anywhere that seemed familiar, the party agreed to help free Gith's people from an Illithid slave encampment where their minds were slowly being drained by the parasitic Mind Flayers. But first Gith managed to open the floating obelisk the party had previously been clinging to to reveal a horde of treasure that made Argar Da'argagaar's eyes spin. In an act of foolish generosity Dench played quartermaster for the party and doled out some legendary magical items, including a Rod of Lordly Might, which went to Kerfuffle the Orc barbarian, a Staff of the Magi, which Argar Da'argagaar gladly accepted, and Plate Mail +2 and Defender longsword which made Perterberator nearly unassailable by non-magical means. Had the party amassed this historic cache of legendary items previously? The answer was hardly relevant to Arg and Perterberator at this point. It was time to kick some Mind Flayer butts (minds?) and free some slaves. 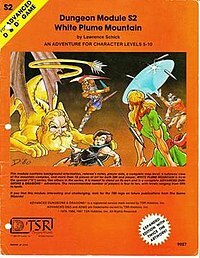 With the Halfling Rogue Chinaski taint stabbing everything in sight, the party managed to hack and slash its way through the living, vegetative vessel of the Illithids, and reach the pool where a powerful Mind Flayer lich was waiting to make a smorgasboard out of the soft and tasty minds of our party. He did not succeed. Through a combination of psionic attacks, a volley of arrows, and a near-fatal Barbarian charge from Kerfuffle, the lich was dispatched, and the gith slaves' minds were freed into the Astral Plane. Unfortunately, the portal of the ship opened up, and the party was also "freed" into the Astral Plane. Exactly how we found ourselves sucked out of the Astral Plane and into Barovia we may never know, but looking back the Dark Powers may even have been involved, but there we were, barely sure of each other's names. We wandered the blighted landscape of Barovia, undisturbed, although feeling constantly under observation, until we found a Vistani encampment. There the Bard Rowan, under the influence of a Vistani tea, was able to spy into the shadowy past of Argar Da'argagaar and Perterberator, and made aware of some of their more dubious decisions, was bribed into not revealing these past, youthful discretions to the rest of the party by being given permission to use their past skullduggery in a legendary song. Many plans were discussed at that campfire, knowing eventually it was inevitable Strahd would beckon us to his castle and most likely end our lives as we knew them. To complicate matters exponentially, the Ranger Dench had been possessed by the brother of Strahd after destroying the Book of Vile Darkness, and was reticent to discuss any plan that involved doing away with Strahd at all. Angers flared, threats were issued, and no plan of action could be agreed upon by the majority. One thing everyone did agree upon, however, was that it would be a grand idea to summon the wizard Mordenkainen with a tuft of his beard that had been obtained by the party in a previous encounter with the thaumaturgist. 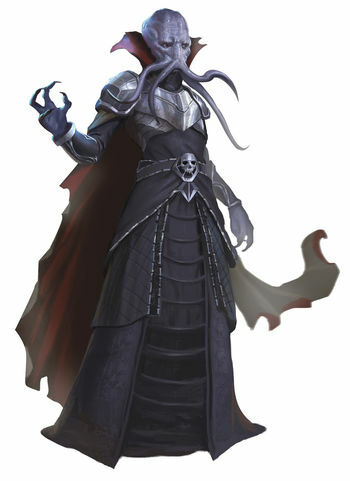 Mordenkainen, we surmised, hated Strahd more than any other living creature, and would be more than happy to aid us in keeping the balance by defeating him. We guessed wrong. Mordenkainen arrived angry as a minotaur with a bee in its bonnet, and began casting a spell immediately. Perterberator had no inclination to see the results of the high wizard's utterations, and put him in a sleeper hold. Upon awaking the wizard was slightly more amenable to small talk. It was then the adventurers learned Strahd was finally to marry Tatyana, and in an act of generosity we were all invited. Mordenkainen included. 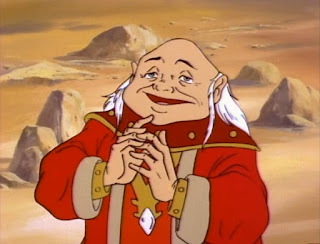 Many in the party were willing to celebrate along with the Strahds and move on, but Argar Da'argagaar and Perterberator had more noble ambitions. Ambitions they shared with the wizard Mordenkainen in an emergency strategy session that lasted long into the night. The plan unfolded with the normal precision Argar Da'argagaar and Perterberator were known for, and had the same devastating consequences that always seem to issue forth from doing the right thing in a deft and noble manner. The feast was magnificent. The ceremony began in the morning and went off without a hitch. Strahd von Zarovich, the vampire tormentor of the Barovian people, plaything of the Dark Powers, and all-around douchenozzle, had finally been re-united with his love and all his hopes and aspirations of ruling Barovia as a mortal man were being realized. Alas, there's the rub. Strahd von Zarovich was now a mortal man. And as all mortal men are, he had this tendency to die when overwhelmed with physical damage, or beheaded by an Eldritch Knight named Aramus Perterberator. Mordenkainen, Argar Da'argagaar, and Perterberator were pleased with the results of their secret plan, but others who had not been consulted, were less so. Among those less pleased happened to be Dench von Zarovich, who shot Perterberator with his Oath Bow, failing to kill him, and other party members who gave fine and ineffective lectures about regime change and why inaction is a perfectly noble and reasonable choice in almost all circumstances. But one other entity was displeased. The demon lord Graz'zt. The skies turned black and peals of thunder rang out as the debonair but deadly demon prince descended to the roof of Ravenloft Castle. Melee ensued. Perhaps, and I use this word knowing its proper context and scope, epic melee. Strahd was there. Mordenkainen was there. Graz'zt was there. And Argar Da'argagaar and Aramus Perterberator were there. 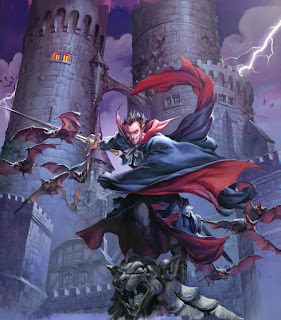 That morning at Ravenloft Castle. Others were also there, but were they? Graz'zt was finally subdued, and driven to the edge of defeat by a barrage of powerful spells, psychic attacks, and brute force. It is possible even Dench von Zarovich stopped attacking teammates long enough to sink an arrow into the demon lord. Clearly surprised at the pluck and determination of his adversaries, the demon lord grabbed the head of Strahd and vanished. The people of Barovia were free. At least as free as the people of Barovia can ever be. But Argar Da'argagaar and Perterberator had made numerous and powerful enemies in their short time as players in the Multiverse. Argar Da'argagaar is a trickster. He's a con man. And he's a charlatan. He hates authority and has an overwhelming compulsion to steal from the wealthy and powerful. Aside from all that, swell Dragonborn. Solid dude. Heart in the right place even when he's engaged in a swindle. And the swindle he came up with next may be the greatest in all known lore. Dench von Zarovich could not get over the death of his brother Strahd. No peace within the party was possible unless something was done, but how could any character of good conscience stand by while Dench resurrected one of the most evil villains in the Multiverse. Argar Da'argagaar hatched a plan. A canard. One that would both set the Multiverse on its ear and eventually save it. As bold as a bucket, Argar Da'argagaar summoned Graz'zt, and as game recognized game, they concocted a scheme the demon lords themselves would be proud of. Graz'zt was to create an ersatz copy of the head of Strahd to placate Dench in his efforts to resurrect his vile brother. When he reuinited the head with the body the resurrection would fail, but he would believe it failed because it was never possible, not because he had been duped. Meanwhile, Strahd's soul would be relegated to the void, forever in the possession of the demilich Acererak. Once again, the plot succeeded magnificently, then failed miserably. And worst of all, in exchange for his favors Graz'zt had received in return the means to enter the citadel city of Sigil. On our way to the meeting where Graz'zt would seemingly reluctantly return the head of Strahd to Dench, we had a marvelously entertaining battle Against the Giants, where they launched huge ice balls first at our doomed cart, then at us with huge hockey sticks. With his newly obtained Fireball, Argar Da'argagaar and the party took out the giants, then cleared the slaver's stockade they were running. We made it to the city of the Drow at the appointed time, and as agreed Graz'zt huffed and puffed, then launched the head at Dench. Strahd's head secured, Dench immediately returned to Barovia to resurrect the evil fiend. As planned, the resurrection failed, but Dench was palliated in believing he had done all he could do. Our Tiefling rogue remembered he had a wish left to be used and wished that Demogorgon would be defeated. Which he was. By Tiamat! who also emerged from the depths, dispatching Demogorgon with ease, then turning her attention to us. Correctly assessing we had no chance of surviving a fight with Tiamat our charlatan Sorcerer Argar did what he always does... tried to trick the devil. But in this case he did have one piece of information Tiamat found worthy of sparing our lives for. Graz'zt was in Sigil, and unless stopped would soon take over the City of Doors and become the most powerful creature in the multiverse. Tiamat agreed to spare us in exchange for being banished to Sigil. What seemed like only moments later to us, The Lady of Pain was cast to the ground in front of us in her humanoid form, looking defeated. She cursed us for having sent both Graz'zt and Tiamat to Sigil, where all Hell had broken out and she had been stripped of her powers. Sigil was defenseless. 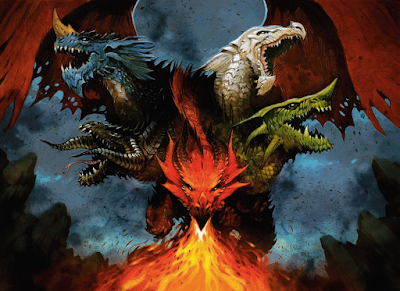 Unless a Dragonlance could be procured there was no reasonable hope of defeating Tiamat and saving the Multiverse. Legend had it there was one place where a Dragonlance could be found. 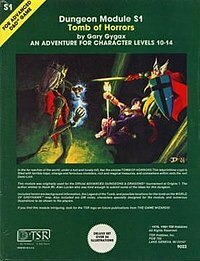 The Tomb of Horrors! We agreed we would seek out the Tomb of Horrors, and brave the mythical dungeon of certain death and its bloodthirsty master, Acererak, but on one condition. If we succeeded we all would become Factols of our own Faction on Sigil. In no position to bargain, the Lady of Pain agreed to our terms, and we set off for the Tomb of Horrors. where no less than three party members were swallowed by purple worms. With time being of the essence we shook this small setback off and headed to the Tomb of Horrors. Knowing the reputation the Tomb had for making even the most seasoned adventurers disappear forever, we set out with extreme caution. After much searching we finally found the entrance to the Tomb, and began the often frustrating, always engaging process of finding the secret hiding place of the demilich Acererak and the Dragonlance we so desperately needed to have any chance of defeating Tiamat. After what seemed like months of wrong turns, elaborate traps set specifically with our demise in mind at every step, and a madman's riddle ringing in our heads, we finally found Acererak's lair. And defeated him easily. With the chamber of Acererak collapsing around us, we decided to return to the trecherous halls of the tomb and seek the real Acererak. After encountering countless traps, vats of acid, killer tapestries, seemingly unsolvable riddles, and shape-shifting hallways, we finally acquired the keys necessary to enter Acererak's real lair. Inserting and turning the keys in the right sequence, we found ourselves face to face with the legendary lich, whose philactery rose above us in the form of giant, amorphous fetus. After several rounds of combat Acererak was actually gaining strength, and using his legendary actions and powerful spells to reduce the party to a critical state, so Perterberator used a wish he had gained from a Djinn in an urn he had opened to help us dispose of Acererak by any means necessary. The Djinn folded the lich in his arms and imploded, sending Acererak to another plane. We gathered the Dragonlance we had come for and found our way out of the Tomb of Horrors. Once again we encountered the Lady of Pain. 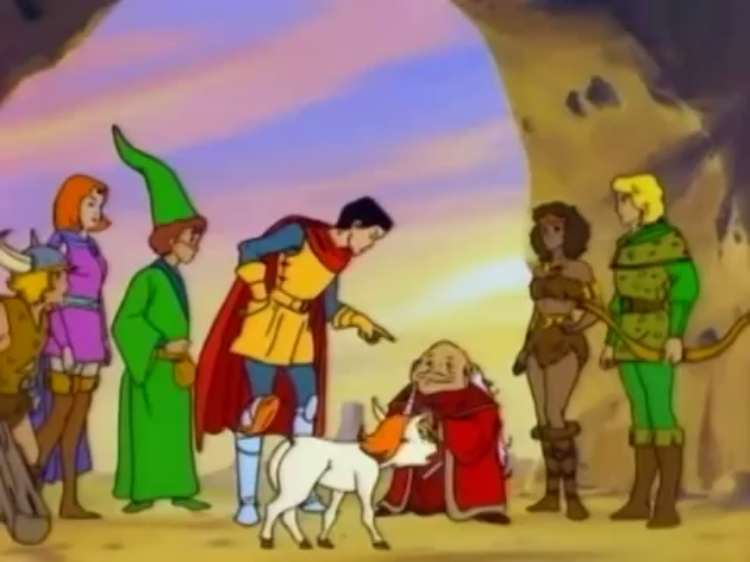 Seeing we had the Dragonlance she once again implored us to return to Sigil and stop the chaos. Peterberator thought we should be rewarded for volunteering for a mission that would mean certain death, and since the Lady of Pain was in no position to bargain she promised to make us all Factol leaders of Sigil if we succeeded. We agreed and a portal was opened to Sigil. But before we could even enter the portal a quizzical creature appeared before us in a puff of smoke. He looked a little bit like this. The odd little creature explained to us that as well as saving the Multiverse he was charging us with one small additional task: there was a group of young adventurers who had strayed from their home and become embroiled in a series of mishhaps on their ongoing quest to return to their home. They would travel with us to Sigil, and if we defeated the evil that had gathered there, we would use the City of Doors to return them to their home. We returned to a Sigil blasted by warfare between several superpowers, including Tiamat, Demogorgon, and Phrexians. Realizing we had no hope of squaring off against any of these three foes, our Mystic proposed a bold plan: he would use his powers of mind control to bond with the Phyrexian leader, and use that dread creature's power to wield the Dragonlance against Tiamat. His ploy was succesful, and the rampaging monstrosity plunged the Dragonlance flush into Tiamat's chest, sending the five-headed abomination back to the Abyss. The Phyrexians were disbanded at our Mystic's bidding and left Sigil of their own accord. In this ingenious manner all three warring interlopers were dispatched from Sigil, but the city was left decimated. The Lady of Pain, restored to power, was true to her word, and several of the heroes of the War of Sigil were made Factols. Aargar named his faction the Aargardians, and his headquarters was established at Club Gynospynx. Aramus Perterberator established the Hall of Bad Dudes, with the purpose of restoring Sigil to her full glory and spreading freedom and enlightenment to all corners of the Multiverse. We bid farewell to the valiant band of adventurers the Dungeon Master had placed in our care, and as they stepped through the door to some small, inconsequential planet named Earth, we knew this one final act was perhaps the thing we had screwed up the least. 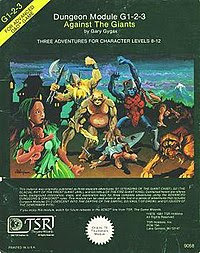 It was six months of bliss for me, having had all the Dungeons and Dragons books as a teenager, but never really getting to play. Our Planescape night is now on a different campaign that involves Krynn, but as it often happens, worlds are colliding, and our Dragonlance characters will apparently soon find themselves in Sigil soon. You can support (or even borrow) my Dungeon Master, Travis Legge by buying his own adventures contained in The Catalog of Calamity or even play with him online at his Patreon page he's running an Eberron campaign right now I play tested and enjoyed very much. I think there are still spots to play online on Friday mornings.